The first Victoria Cross awarded to a private in World War I has sold for £276,000 at auction. The medal, awarded to Pte Sidney Godley, of East Grinstead, West Sussex, was expected to fetch up to £180,000. Pte Godley manned a machine-gun position defending Nimy Bridge in Mons while under fire from German soldiers in the first weeks of the war. A second VC, awarded posthumously to a Gloucestershire soldier, was sold for £240,000 at the same auction. Oliver Pepys, of Spink auction house, in London, described Pte Godley's medal as "hugely important". He said: "The Godley VC is one of the most distinguished medal groups of the Great War, so it was not surprising that it attracted much interest. "I am delighted that the sale drew attention to such a valiant man." Pte Godley was presented with the top military honour by King George V in 1919 after four years as a prisoner of war. The hammer price bid by the anonymous private collector was £230,000, but after other charges, the total amount paid will be £276,000. The auctioneers are not identifying the seller. Pte Godley, who was 25 when he was sent to the Western Front with the 4th Royal Fusiliers, was badly wounded in the attack, on 23 August 1914. He had shrapnel in his back and a bullet in his skull, but protected British positions in the face of a German onslaught until he was captured. During his four years as a prisoner in Germany, he was told by his captors that he had been awarded the VC and was invited to dine with the Germans one Christmas Day in recognition of the honour. Pte Godley escaped in 1918 when prison guards deserted their post. He died in 1957, aged 68, and was buried with full military honours in Loughton Cemetery in Essex. Since his death blue plaques have been placed at East Grinstead Town Council offices and at the house in Torrington Drive, Loughton, where he lived for some time. In 1992 Tower Hamlets Council named a block of flats "Sidney Godley VC House" in honour of the former soldier who worked as a school caretaker in the borough. At the same auction, a group of five medals, including a Victoria Cross, awarded posthumously to Capt A F G Kilby, from Cheltenham, was sold for a total of £240,000. 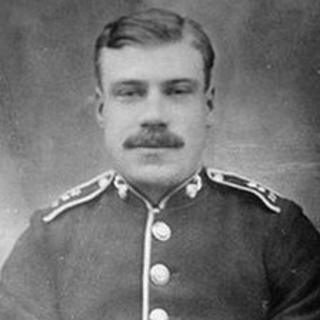 Capt Kilby was killed in the Battle of Loos in 1915. He was last seen encouraging his men forward towards the German lines despite having had his foot blown off.